It's Monday again! I hope the weekend went well for all of you! I don't know if it's the same for everyone...but weekends always seem too short for us. I guess it's how it is when you're having fun. Though it was disappointing that my poor blog was flagged as an "attack site" by Google for more than 15 hours last Saturday, my family and I had a great time during the weekend. We visited a close family friend and enjoyed some good movies and yummy food. The sun came out long enough so we were able to go to the park and get some fresh air. Then yesterday, we had fun watching the Super Bowl! It was really a good game between NY Giants and NE Patriots, and Madonna's half time show performance was amazing! We also find some of the commercials really funny so we all had a good laugh. Before that, the girls and I had a lovely bonding time baking these delicious cupcakes which we ate after watching the game. It was truly another well spent weekend...and there's no better way to end it than with these cupcakes. 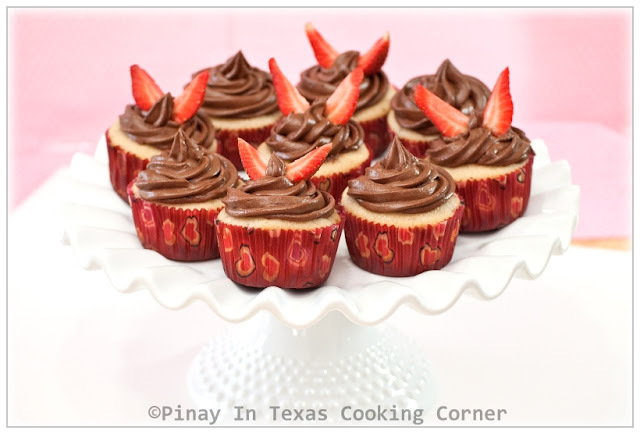 These are Strawberry Cupcakes with Chocolate Frosting which my husband calls "total temptation". He just couldn't resist these beauties! The goodness of strawberries and chocolate combined in one delicious treat is something he couldn't avoid. Well it's true for me and the girls too! 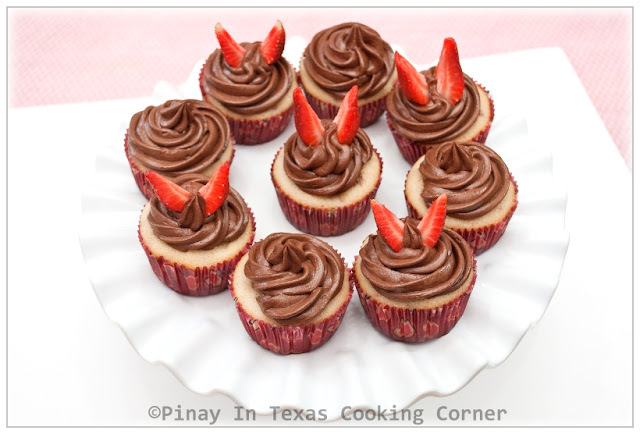 Because February is a month when all I could think of is chocolates and the color red, I think this is the best time to share this recipe with you! 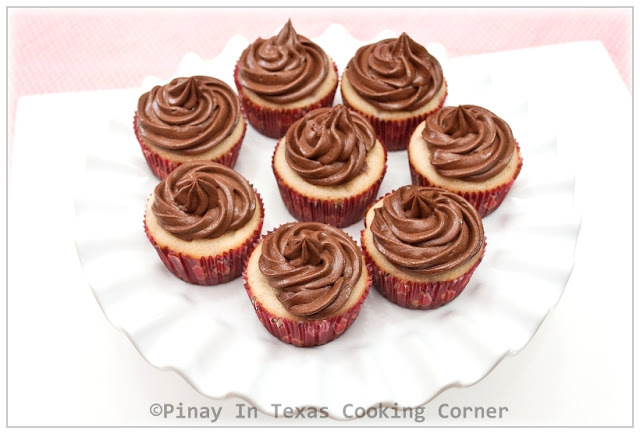 These cupcakes are wonderful Valentine treats for you and your loved ones. 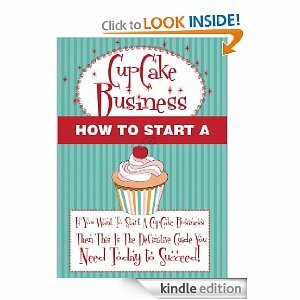 And oh, speaking of cupcakes, I came across this e-cookbook on How To Start A Cupcake Business. If you are someone who loves cupcakes and you are considering to start your own business, this will be helpful! This book was written by Danielle Aimes and is available in Kindle Edition at Amazon.com. It has step-by-step guide and helpful tips on naming your business, creating a business plan, even on developing a theme and logo and stocking your kitchen so you can create and sell the product. Do check it out! It's such a great read for anyone thinking of starting a cupcake business! 1. In a bowl, mixed chopped strawberries and 2 Tbsp sugar until strawberries are well coated. Cover with plastic wrap and put in the refrigerator until ready to use. 2. Preheat oven to 350F. 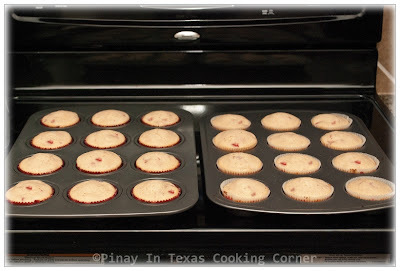 Line 2 muffin pans with baking cups. 3. In a medium bowl, combine the flour, baking powder and salt. 4. In another bowl, combine the butter, sugar and vanilla. Beat on medium speed until light and fluffy. Beat in the eggs, one at a time, mixing well after each addition and scraping down the sides of the bowl as needed. 5. With the mixer on low speed, add the flour mixture in two additions alternating with the milk, mixing each addition just until incorporated. 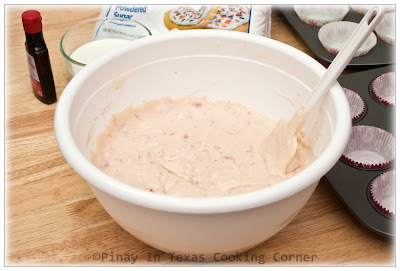 Gently add in the chopped strawberries including the syrup from the strawberry-sugar mixture. Continue beating just until well combined. 6. 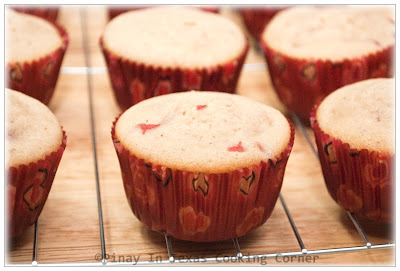 Fill each cupcake liner to about ¾-full. Bake for about 25 minutes or until light brown or until a toothpick inserted in the center comes out clean, rotating the pans halfway through baking. 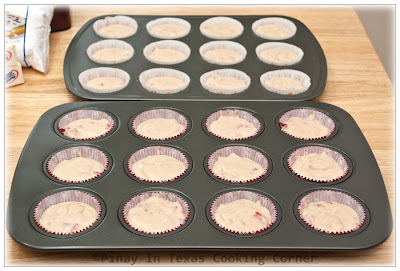 Allow to cool in the pans a few minutes, then transfer to a wire rack to cool completely. 7. 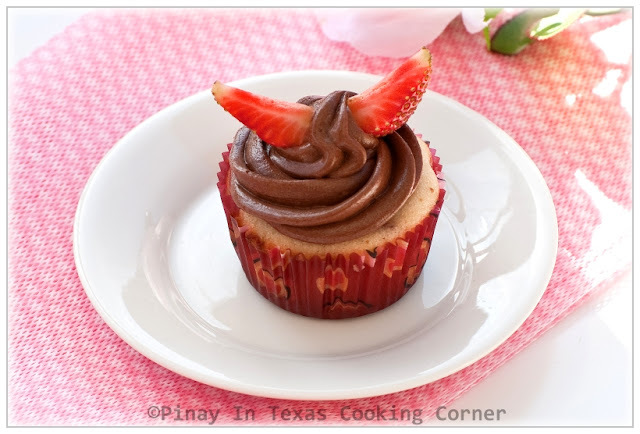 Frost cooled cupcakes with Chocolate Frosting as desired, and garnish with fresh strawberries. 1. In a bowl, cream together butter and cocoa until combined. Add cream and vanilla, and beat until smooth. 2. 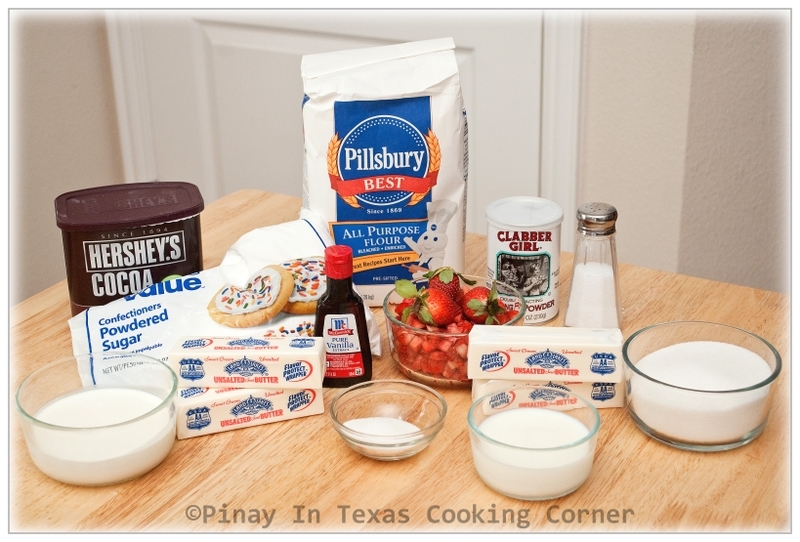 Gradually beat in confectioners sugar until desired consistency is achieved. Adjust by adding more cream or confectioners sugar if necessary. these are perfect for valentines! WOW! Absolutely beautiful! In spite of the computer issues, it does sound like you did have a wonderful weekend. It is always more fun in the kitchen with little helpers! Also, the team did turn out some delicious cupcakes. The flavor combo as well as the presentation gets a definite thumbs up from me. Have a great evening! These look so good and I love your frosting pen thing! I bought a frosting kit and have not had the patience to play around with it yet. LOL horrible I know. Good thing I can view your page now ;D Several times since Saturday until yesterday morning , I can't accessed to my account properly after I clicked yours :D My site was shutdowm temporarily ugh ! Freakin' malware & google tsk tsk Anyway , that cupcake looks fab ! 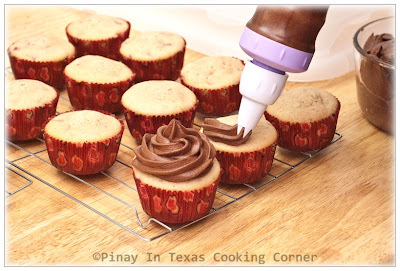 I love the perfectly piped chocolate frosting ;) Yummy photos , too ! Mmmmm. Yum! I'm really kinda glad there's not one of those sitting within my reach right now. lol They look irresistible! i love your site soo much! im a mother of two and a plain housewife, and since then, cooking and pastry is my passion, i spent most of my time in the kitchen with my little ones hehe, to them parang play session. . .
Hi Maria! Glad to have you here! 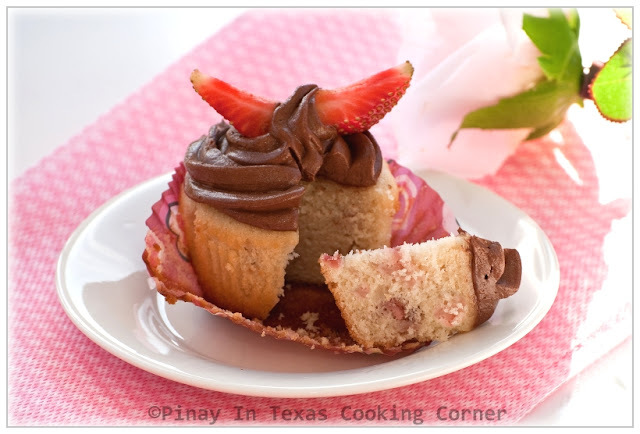 Hi Tina, I love your cuppies especially the topping with strawberry. Your piping skill is very good and lovely presentation too. That is exactly what my son was telling me on Sunday night when i was tucking him in, that weekends are too short! And I replied that when you have fun, time passes very fast! Anyway, the cupcakes are awesome and I don't blame your husband for calling them total temptation because that's what they are! Tina! These look absolutely divine. Love your presentation. I have to agree with your hubby that these are total temptation and real beauties. Such a great recipe and love the wonderful outcome. Ohh holy yumminess! :)) Just beautiful and delicious looking! Great job!!!! oh wow! These look so so so super good. Tina, these are just perfect for V-Day! No wonder your hubby is so in love with u. Hahaha! Beautiful and scrumptious treats! Perfect for Valentine's day! gorgeous cupcakes, I love chocolate with strawberries so these would disapear real fast at my house.